I've been a BIG fan of NARS Monoi Body Glow for years. J Lo once had it on at an award show which made me think - its gotta look great on my skin too! And it did. The smell is delicious and tropical, everyone always comments on it. The beautiful, shimmery oil makes my skin golden soft. If my tan needs a little boost before wearing a strapless top- this does the trick. LOVE IT. Since it worked out well for me, I wanted to try the Body Glow without the shimmery stuff (Glow II). 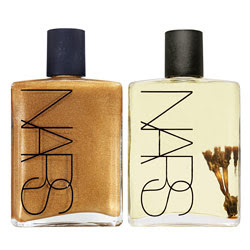 Luckily, I found the NARS Body Glow Set in 1 oz bottles. YAY- The best of both worlds! I found the 1 oz 2 pack randomly on a shelf in a Las Vegas Sephora. They are hard to track down but maybe you'll have better luck than me. I have yet to try the Body Glow II, but I heard it is supposed to be moisturizing and gives a radiant glow. I'll let you know how it goes.